This post is sponsored by OXO, however all opinions are mine. 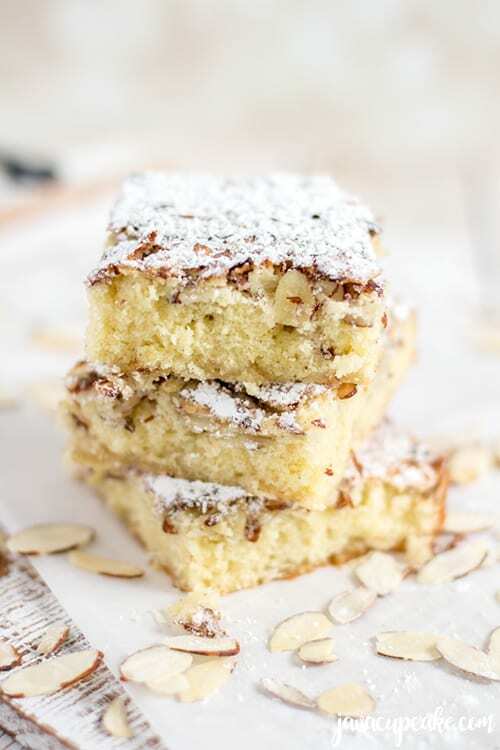 The marriage of crisp almonds and chewy cake bring these Swedish Visiting Cake Bars to life making them a classically delicious dessert! I’m thrilled to be participating in Cookies for Kid’s Cancer again this year! Cookies for Kids’ Cancer was founded by two OXOnians (OXO employees) who were inspired by their son Liam’s battle with pediatric cancer, a disease which claims the lives of more children in the US than any other disease. 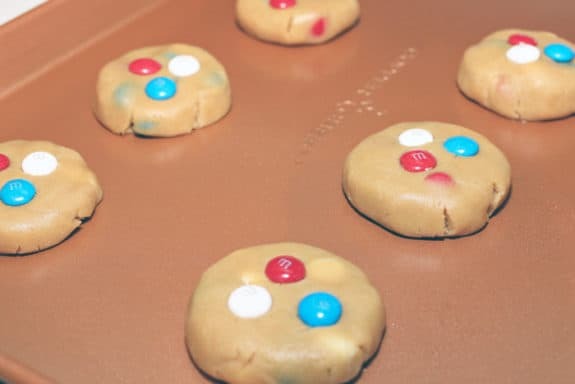 Cookies for Kids’ Cancer provides inspiration and support to allow anyone to easily get involved in fundraising to find a cure for pediatric cancer. OXOnians regard each other as family. The news of Liam’s diagnosis hit them hard and they have been personally involved with this worthy organization from the beginning. 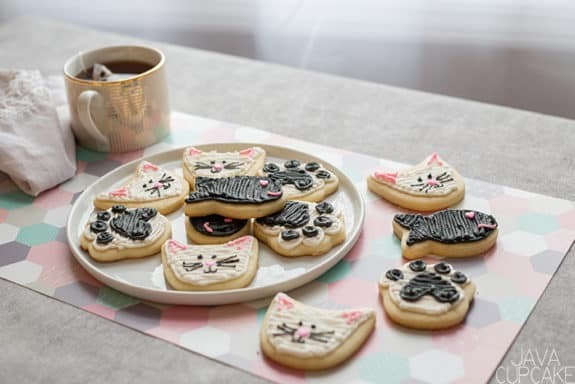 As part of Cookies for Kid’s Cancer this year, OXO selected group exclusive group of bloggers to to receive an exclusive recipe and a set of coordinating baking products and tools to make that recipe. 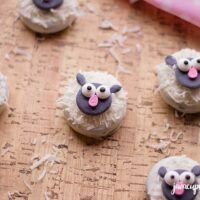 For each blog post and recipe shared, OXO will donate $100 to Cookies for Kid’s Cancer (up to their $100,000 commitment). How incredibly awesome is that! The recipe I was given to recreate is Dorie Greenspan’s Swedish Visiting Cake Bars. I have been a supporter of Cookies For Kids Cancer from before Day 1 and with good reason: It’s a targeted source of funding for research into pediatric cancer treatments. That pediatric cancer is so prevalent and so poorly funded is a terrible paradox. Cookies for Kids Cancer is changing this and I love helping them reach their goals. These are a mash-up of two recipes I love: almond-meringue topping, which I usually use on fruit tarts and (a variation of the) Swedish Visiting Cake, which is usually unadorned. I can no longer remember when or why I married these two, but once I did, the knot was tied for life — the crisp almonds and chewy cake make a perfect couple. The cake is supremely satisfying and the topping is unusual in that it bakes to a meringue finish, but there’s no whipping involved. 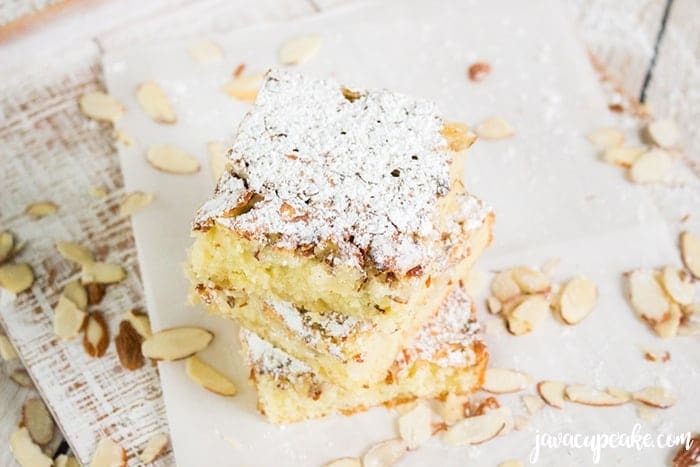 You just mix egg whites and confectioners’ sugar together — I do it with my fingers — swish sliced almonds around in the mix and spread it over the batter. The oven does all the work. Since 2011, JavaCupcake has participated in raising awareness and money for Cookies for Kid’s Cancer. 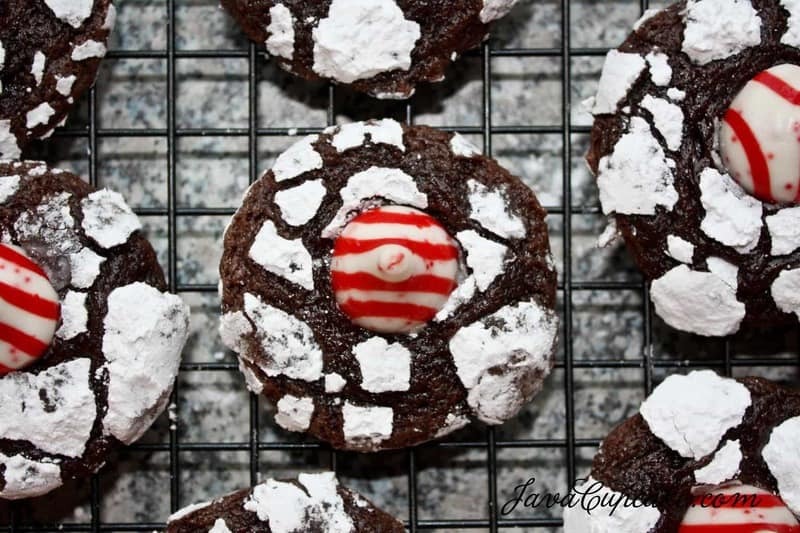 We started with the Great Food Blogger Cookie Swap and now we’re working with OXO! It’s a fantastic way to give back to the community with my fellow bloggers. OXO and it’s chef-supporters of Cookies for Kids’ Cancer hope this inspires people to host their own Cookies for Kids’ Cancer bake sales! 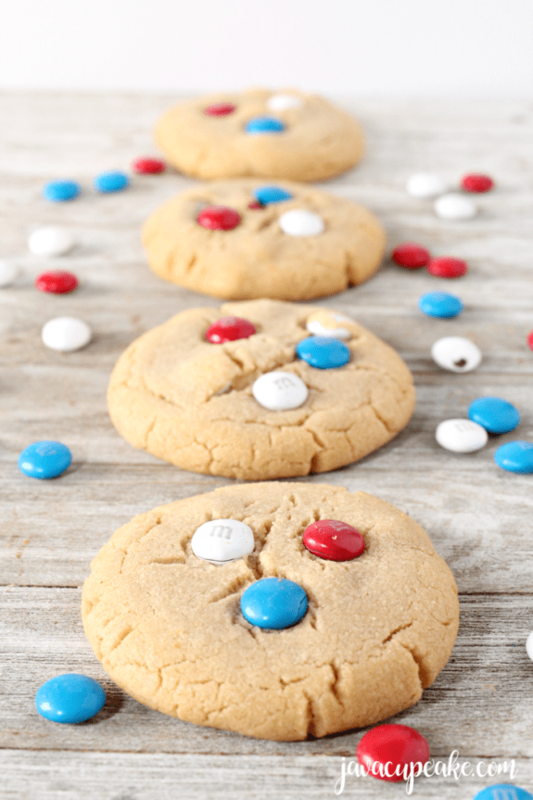 Join in the Cookies for Kids’ Cancer challenge by registering your event online. If you mark that you were inspired by OXO when you register, we’ll match proceeds from your bake sale up to our annual commitment. 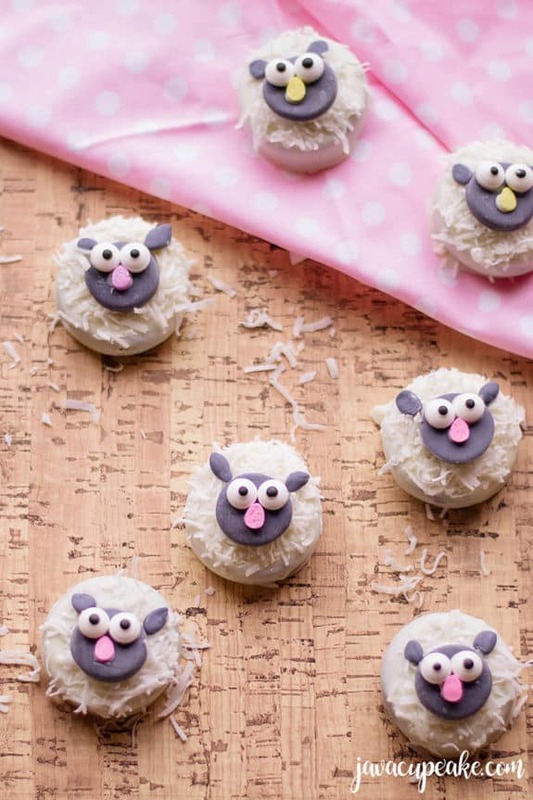 Check out these cookie recipes from past Cookies for Kid’s Cancer fundraisers! Put the sugar in a medium bowl and pour over the egg whites. Using your fingers or a fork, mix until the sugar is moistened. If there are lumps, ignore them. 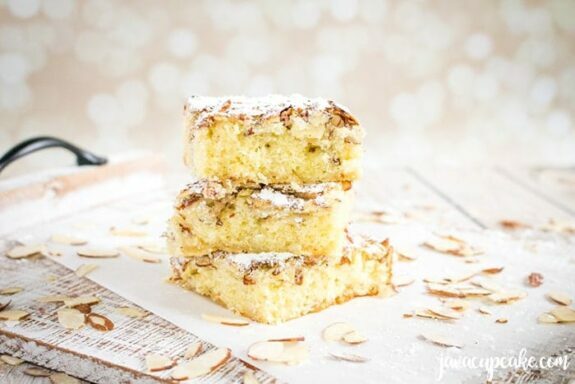 Toss in the almonds and stir them around until they’re coated with the sugared whites. Set aside while you make the batter. Working in a large bowl, whisk the sugar, eggs and salt together until the mixture lightens in color and thickens a little, about 2 minutes. Whisk in the vanilla and almond extracts. Switch to a flexible spatula and gently stir in the flour. When the flour is fully incorporated, gradually fold in the melted butter. You’ll have a thick batter with a lovely sheen. Scrape it into the pan and use the spatula to work the batter into the corners. The layer will be very thin. Give the topping another stir and turn it out onto the batter. 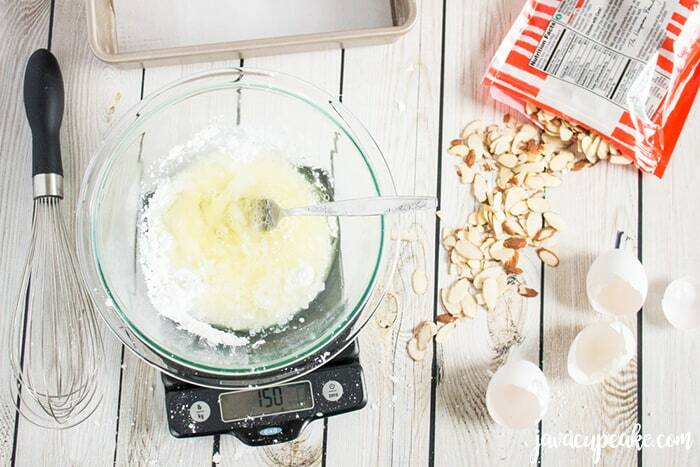 Use a spatula to spread the almonds evenly over the mixture, making sure to get nuts into the corners too. 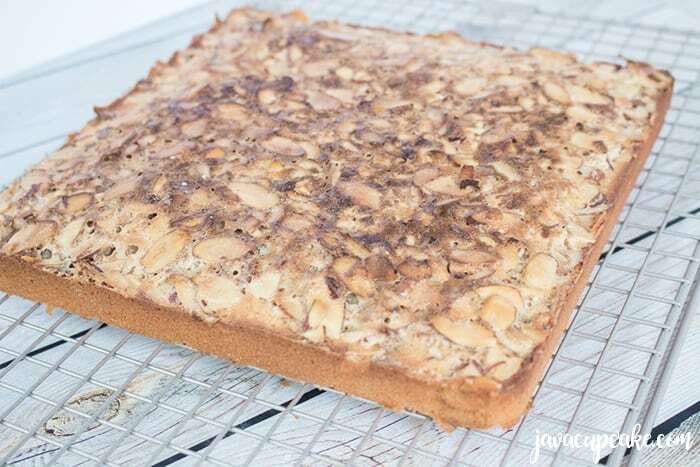 Transfer the cake to a cutting board and, using a long, thin knife, slice it into nine 3-inch squares. For smaller portions, cut each square into two triangles. 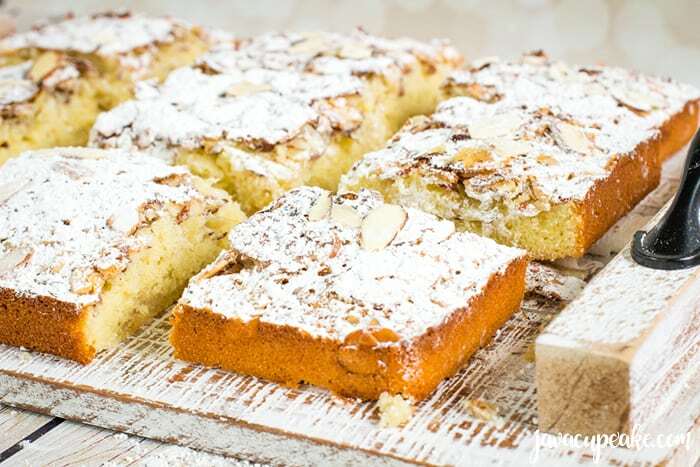 Dust the bars with confectioners’ sugar just before you serve them. This is a sponsored post on behalf of OXO. 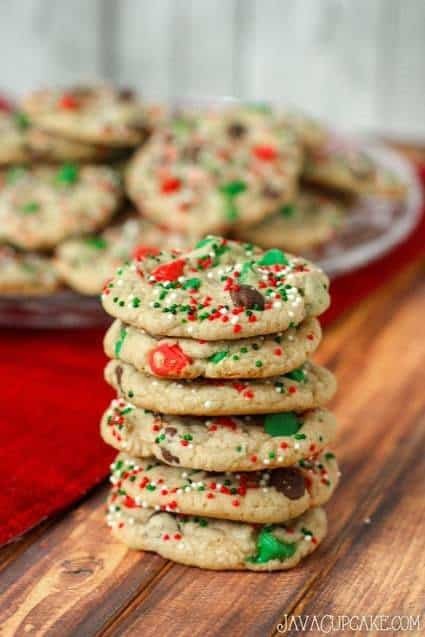 Classic creamy, smooth peanut butter makes these Peanut Butter M&M Cookies out of this world delicious and the perfect mid-week treat! We’ve all known and loved peanut butter since childhood. What would our school lunches have been without peanut butter or a PB&J sandwich? Whether you’re a fan of creamy or chunky, peanut butter has always had a place in American culture. But have you ever wondered how peanut butter came about? And how did it become so popular? Peanut butter actually dates back to Aztec times. The Aztecs mashed roasted peanuts into a paste, somewhat different from what we know of as peanut butter today. But many people have been credited with the title of peanut-butter-inventor, among them George Washington Carver. However, he did not invent peanut butter; instead he promoted more than 300 uses for peanuts, among other crops such as soy beans and sweet potatoes. The actual invention of peanut butter, its process of manufacture and the machinery used to make it, can be credited to at least three people. In 1884 Marcellus Gilmore Edson of Canada patented peanut paste, the finished product from milling roasted peanuts between two heated surfaces. In 1895 Dr. John Harvey Kellogg (the creator of Kellogg’s cereal) patented a process for creating peanut butter from raw peanuts. He marketed it as a healthy protein substitute for patients without teeth. In 1903, Dr. Ambrose Straub of St. Louis, Missouri, patented a peanut-butter-making machine. In 1922, chemist Joseph Rosefield invented a process for making smooth peanut butter that kept the oil from separating by using partially hydrogenated oil. In 1928 he licensed his invention to the company that created Peter Pan peanut butter. And in 1932 he began producing his own peanut butter under the name Skippy. Peanuts are actually not nuts but legumes grown underground. The U.S. is the third largest producer of peanuts (Georgia and Texas are the two major peanut-producing states). China and India are the first and second largest producers, respectively. More than half of the American peanut crop goes into making peanut butter. U.S. presidents Jimmy Carter and Thomas Jefferson were peanut farmers. Americans eat around 700 million pounds of peanut butter per year (about 3 pounds per person). An average American child eats 1,500 PB&J sandwiches before graduating from high school. 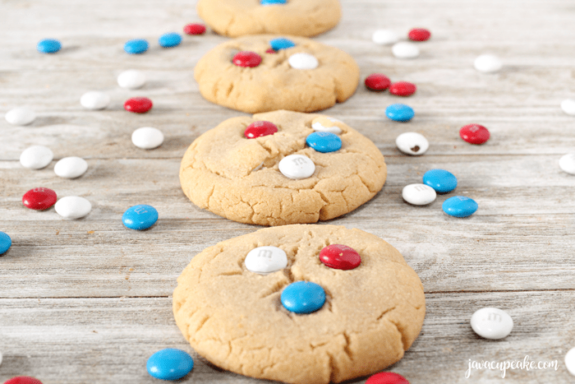 Peanut Butter M&M Cookies are in my Top 5 favorite cookies! Preheat oven to 400F degrees, Line baking sheet with parchment paper. In the bowl of your sand mixer, combine the peanut butter, shortening and sugars. Beat until smooth then scrape the sides and bottom of the bowl to make sure everything is incorporated. Beat on high for 2 minutes or until light and fluffy. Add the eggs and mix for 30 seconds. Scrape the bowl again. In another bowl, sift together baking soda, flour and salt. In two parts, add that mixture to the mixing bowl on low speed. Increase speed and mix until combined. Next, add in your peanut butter, soda, flour, and salt. Mixing well. 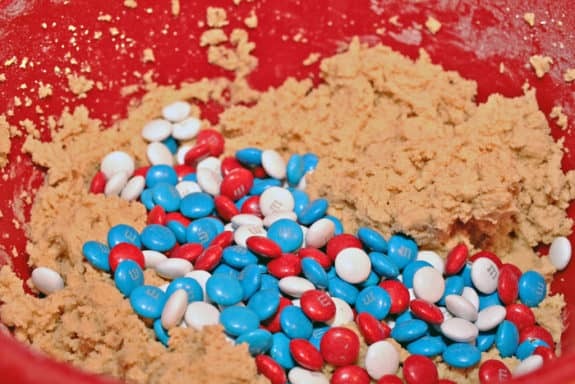 Mix in half of the M&Ms with the mixer on low speed. Once chilled, roll dough into 1- 2 in. balls and place them on prepared baking sheet. 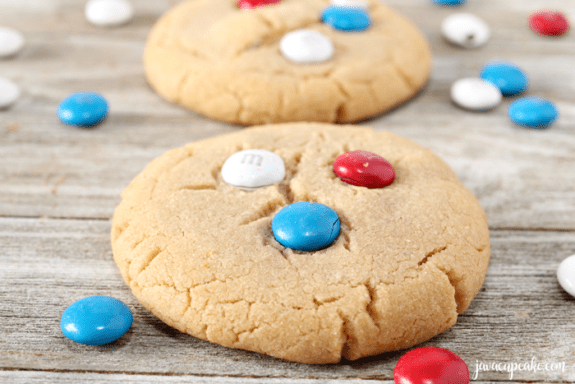 Press a few M&M's on top of each cookie. 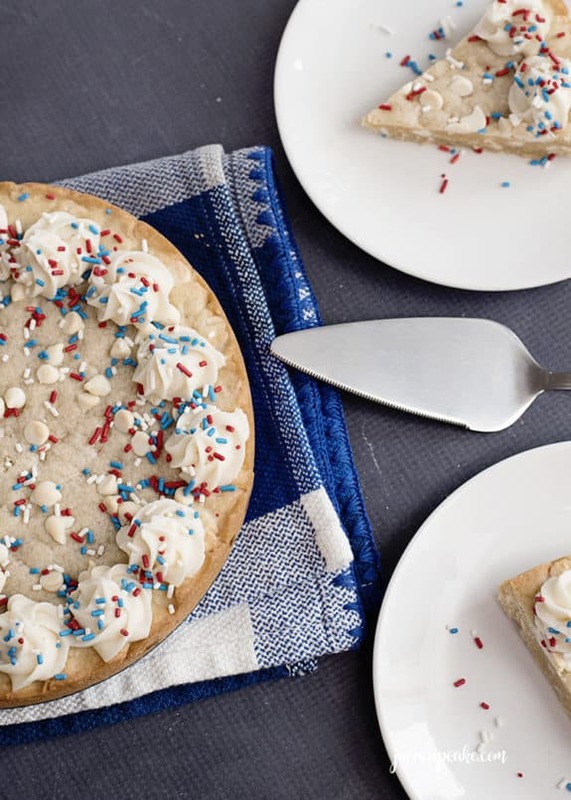 Need a dessert to bring to your 4th of July party? 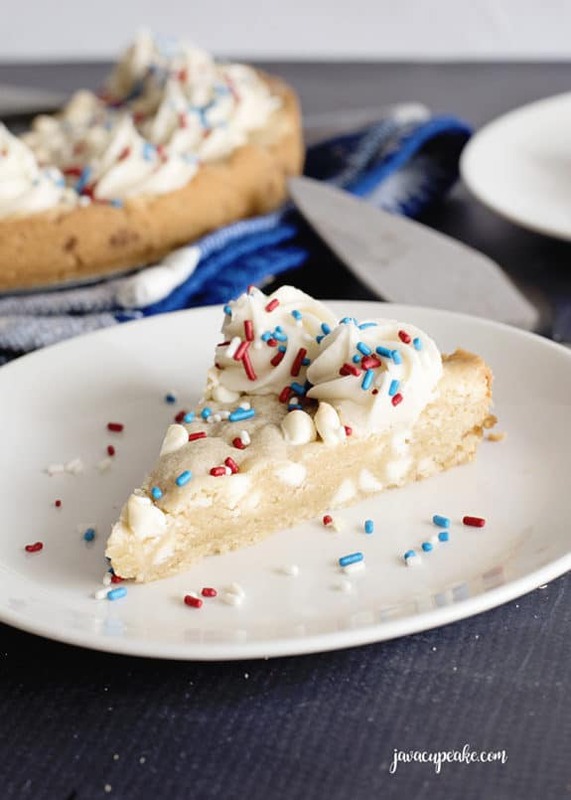 This simply delicious Patriotic Sugar Cookie Cake made white chocolate chips and red, white and blue sprinkles is the perfect Independence Day dessert! This year I’m hosing a HUGE July 4th Celebration at the Armed Forces Retirement Home in Washington, DC. I’m expecting about 3000 people to attend to enjoy food vendors, music, entertainment, carnival games and fireworks! 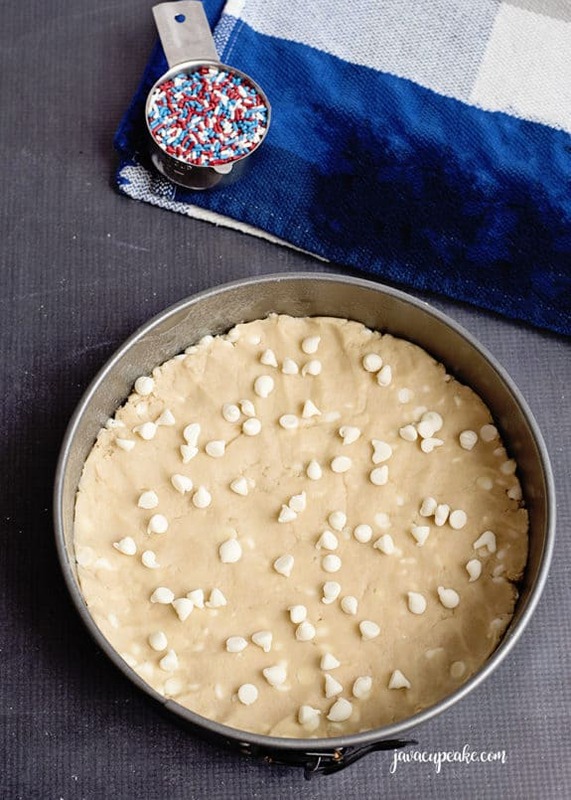 I don’t have to cook or bake for the celebration, however that won’t stop me from making this super cute Patriotic Sugar Cookie Cake for my kids to enjoy in the days leading up to the 4th of July! What I love most about this dessert is how incredibly quick and easy it is to put together and bake. The ingredients are ones that I always have on hand in my pantry so I don’t have to run to the store to pick up supplies to make. The second thing I love about this dessert is that it’s a one-bowl recipe. 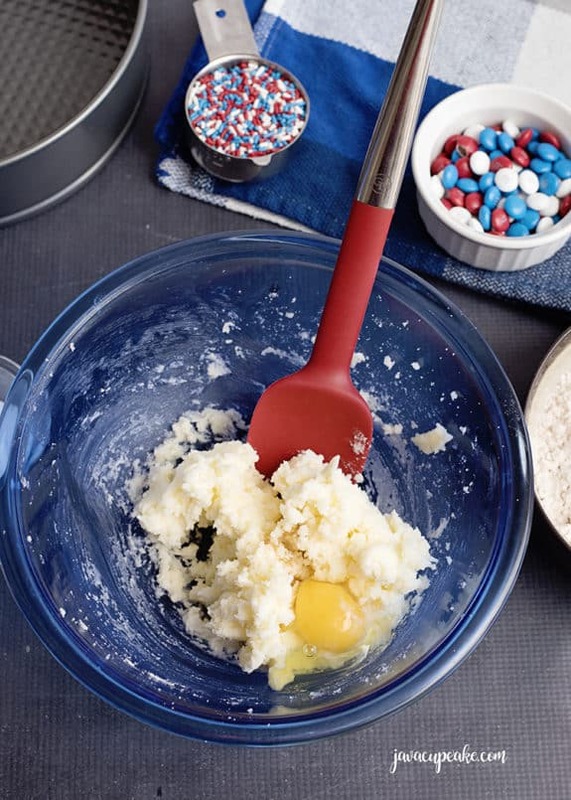 Ingredients don’t need to be measured out into other bowls which means less mess, less clean up and easy baking! 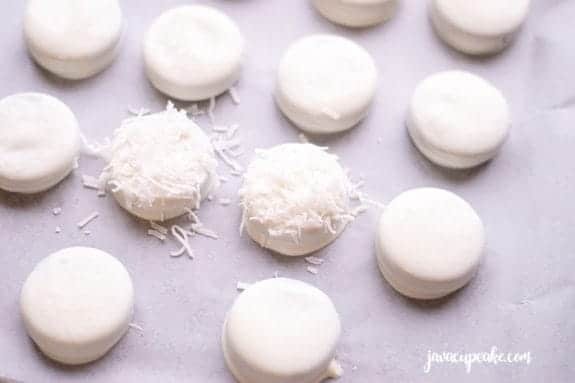 My husband loves this recipe because of the white chocolate chips. 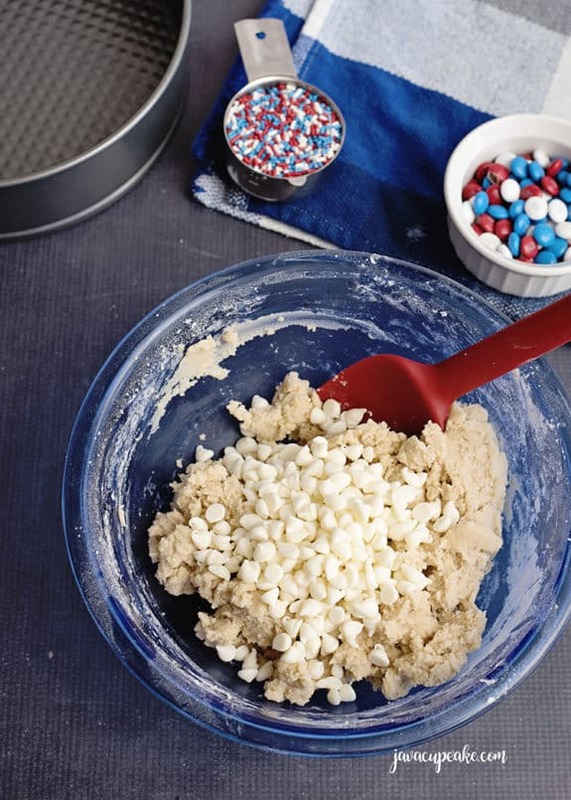 You could easily substitute milk or dark chocolate chips, however the patriotic sprinkles wouldn’t stand out as much as with white chocolate chips. Making my husband love this recipe is a win in my book because he rarely likes dessert. So what exactly is a cookie cake, you may be asking? It’s a dessert that is made with a cookie batter base but baked in a cake tin. It’s thick and rich like a cookie, but cuts like a cake into slices! Frosting. 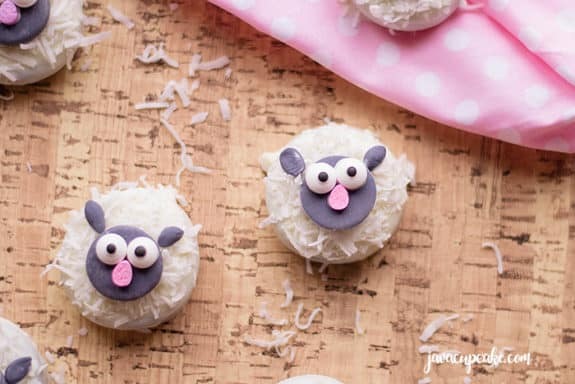 The frosting totes makes this dessert a cake too! 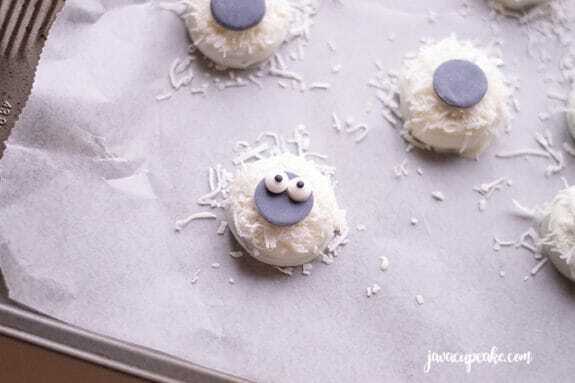 Lots and lots of sweet, creamy buttercream frosting decorating the top of this cookie transforms it into a decadent cake! 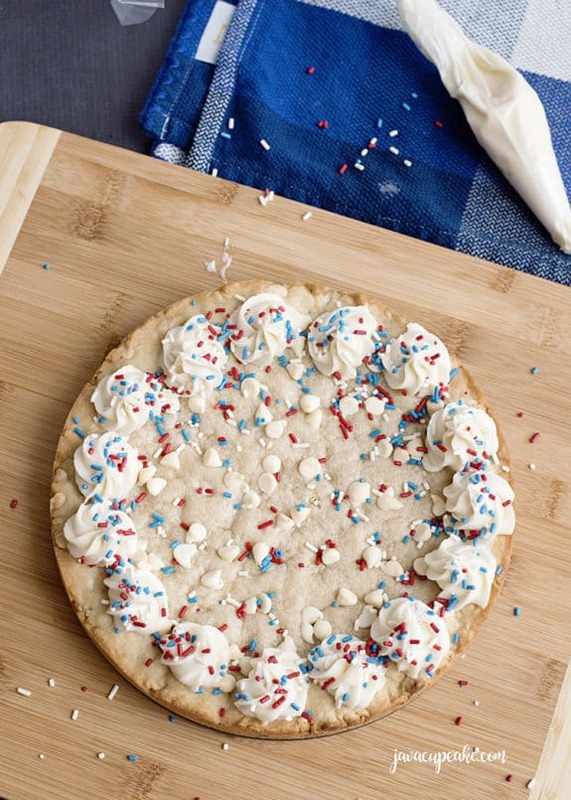 And the sprinkles make this dessert patriotically perfect. Don’t you think? I mean, everything is better with sprinkles! I think I’ll just serve myself up a big slice, grab a glass of milk and enjoy! 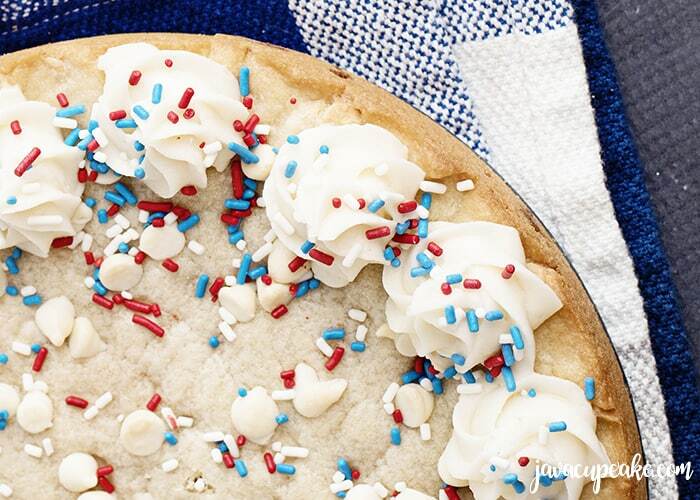 Nothing better than a Patriotic Sugar Cookie Cake for the 4th of July! 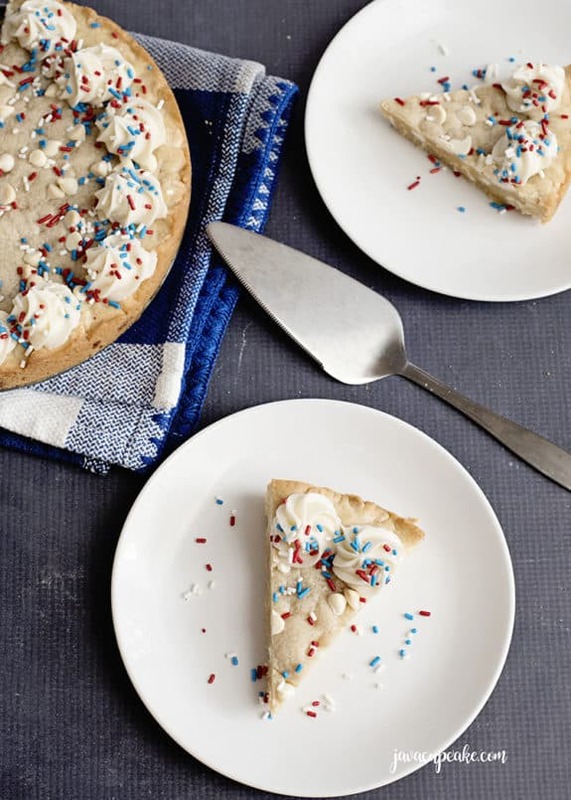 No matter what you’re doing to celebrate the Independence of the United State of America, celebrate it with a deliciously simple Patriotic Sugar Cookie Cake! 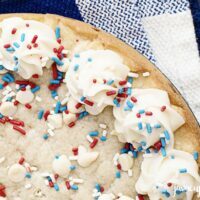 This simply delicious Patriotic Sugar Cookie Cake made white chocolate chips and red, white and blue sprinkles is the perfect Independence Day dessert! Preheat oven to 350 degrees. Prepare a 9-inch spring form pan by spraying the bottom and sides with non-stick spray. Combine the butter and sugar in a medium bowl and mix until smooth. Add in the egg, vanilla, baking soda, salt and cream of tartar. Mix until well combined. Slowly add in the flour and mix until fully incorporated. Fold in the white chocolate chips. Pour the batter into your prepared spring form pan and press to the edges. Top with a few more white chocolate chips for presentation. Bake for 20-22 minutes, just until edges are a golden brown color. Remove from the oven and allow cooling for 15 minutes. Then, remove the spring form side and allow the cake to cool completely before frosting. 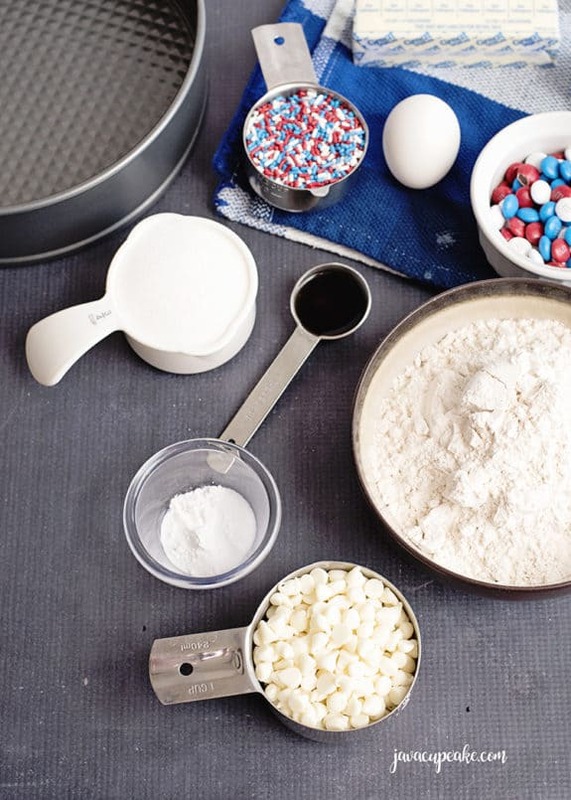 With a stand mixer or a hand mixer, combine the butter and powdered sugar. Add in the salt, vanilla and heavy cream. Mix everything until it’s smooth and creamy. Scoop into a piping bag with a 1m tip and decorate your cake. Top with sprinkles before the icing sets. 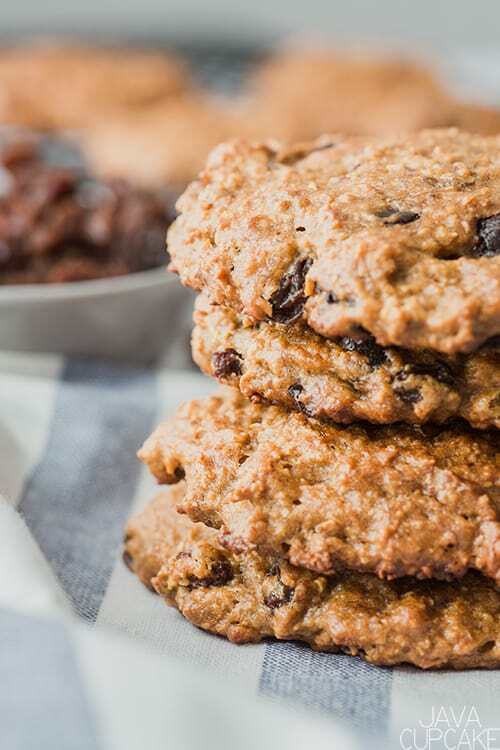 When you want a treat but you don’t want to waste calories, you will definitely want to make these delicious Peanut Butter Oatmeal Cookies! My New Year’s resolution was to make healthier life choices, but in small, manageable places. The first new choice I made was to change my breakfast from sugar cereal topped with berries to a protein rich oatmeal topped with berries. If you’ve never tried homemade oatmeal, consider my recipe for Overnight Oatmeal in a Jar. It’s simple and so delicious! 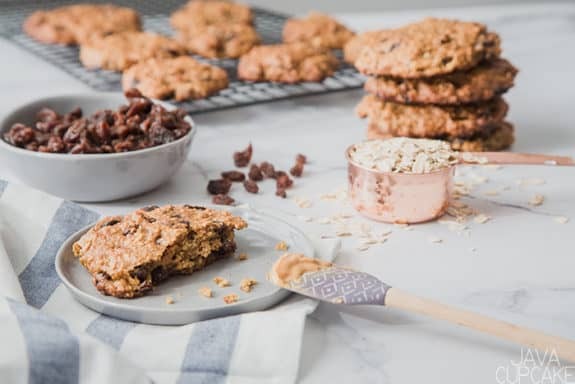 What I love most about these Peanut Butter Oatmeal Cookies is that I don’t have to feel guilty when I want to enjoy one. 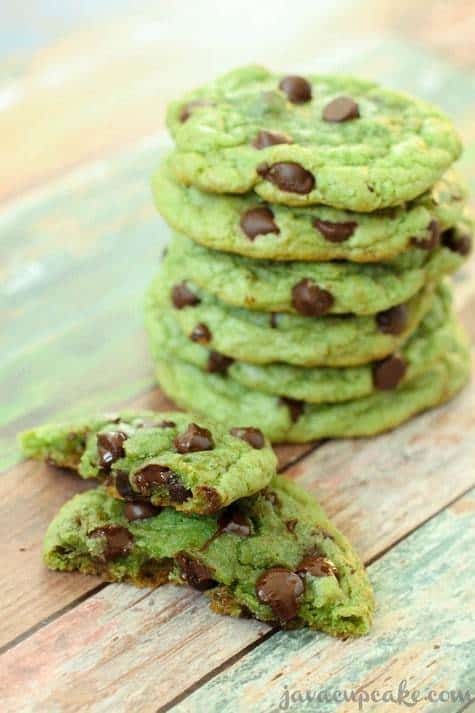 I thought hard about the recipe for these cookies and made sure to choose ingredients that would pack a punch! 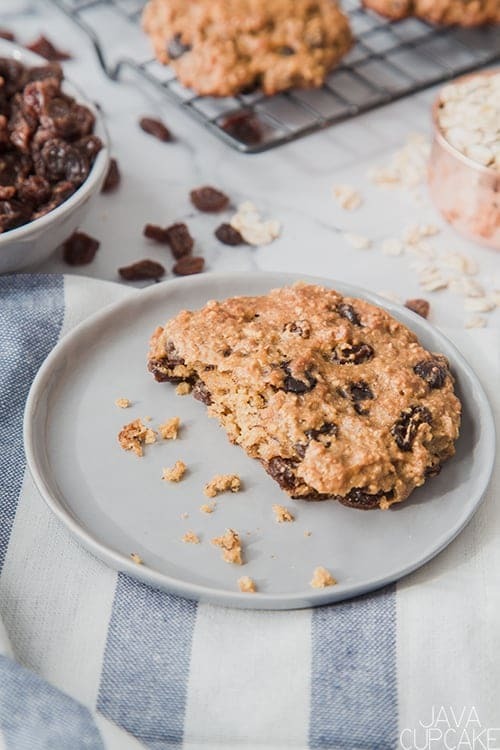 Depending on what kind of peanut butter and oats you use, each cookie could potentially have 10g of protein in each one! That’s a snack I can feel good about giving my kids and treating myself to! You could also substitute agave or maple syrup for the honey. 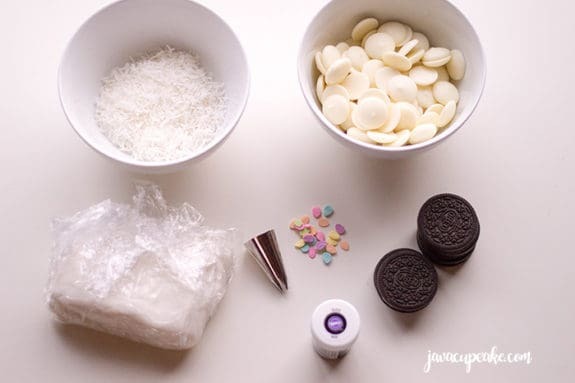 Super easy substitution to make! 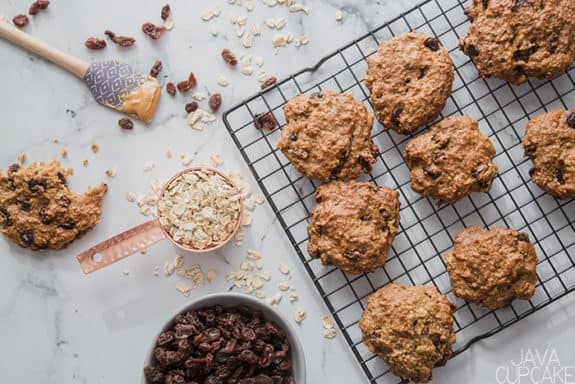 I really hope you enjoy these fantastically delicious and guilt-free peanut butter oatmeal cookies! In a large bowl, whisk together the mashed bananas, peanut butter, eggs, honey, and vanilla until combined. Add the oat flour and baking soda and fold together until no more flour can be seen. Pour in the steel cut oats, raisins and chocolate chips and fold together. When ready to bake, preheat oven to 375F & line baking sheet with parchment paper. 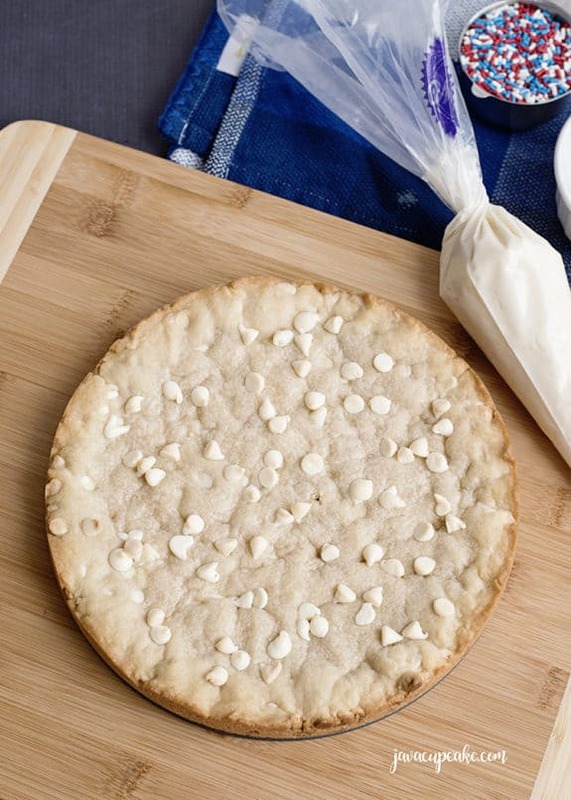 Using an ice cream scoop with a 1/4 cup serving, scoop chilled dough and place evently onto parchment paper leaving 2-3 inches between each mound. Gently press down with a spatula to form a disk. Bake 12-14 minutes or until the tops and sides are firm and a toothpick comes out clean. Cool on the baking sheet for 10 minutes before removing to wire rack. Looking for something a little less tradition for Valentine’s Day? 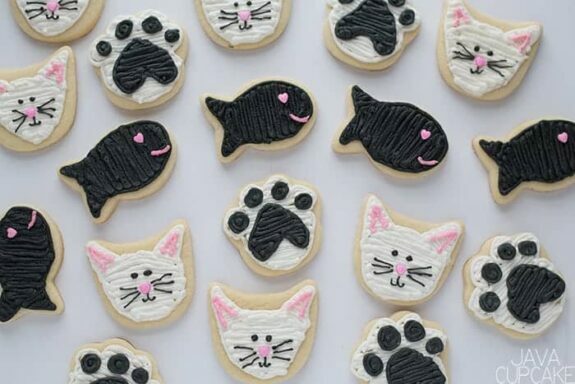 Try these super adorable Valentine’s Day Cat & Fish Cookies made with sugar cookies and buttercream! 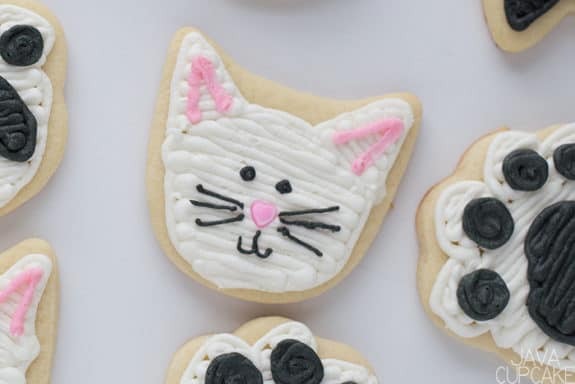 I have no reason for making these Valentine’s Day Cat & Fish Cookies other than I fell in love with the cookie cutters when I saw them. I mean, fishies and kitties? This cute set included a cat head, a cat paw, and a fish. I don’t know which one I loved more, the kitty head or the fishy! Seriously both so adorable! Have you ever shopped at Charming Charlie? It’s a jewelry store that also sells the cutest accessories and fun home stuff! I love them because everything is sorted by color and theme. 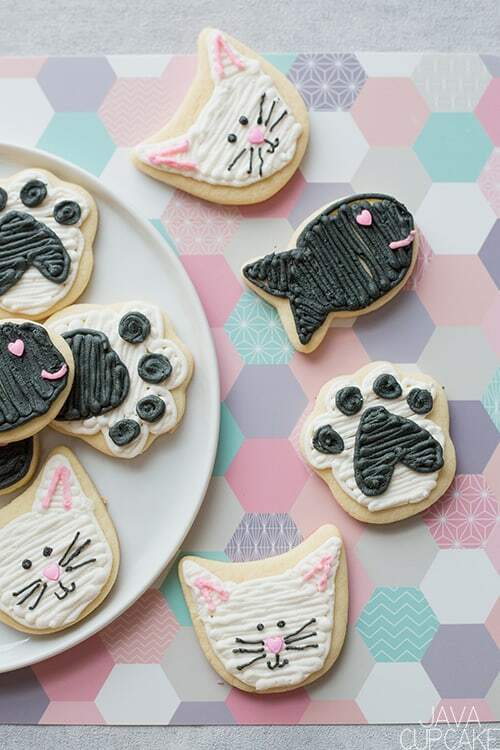 I found these adorable cat & fish cookie cutters at my local Charming Charlie and luckily for you they are on clearance on their website now! 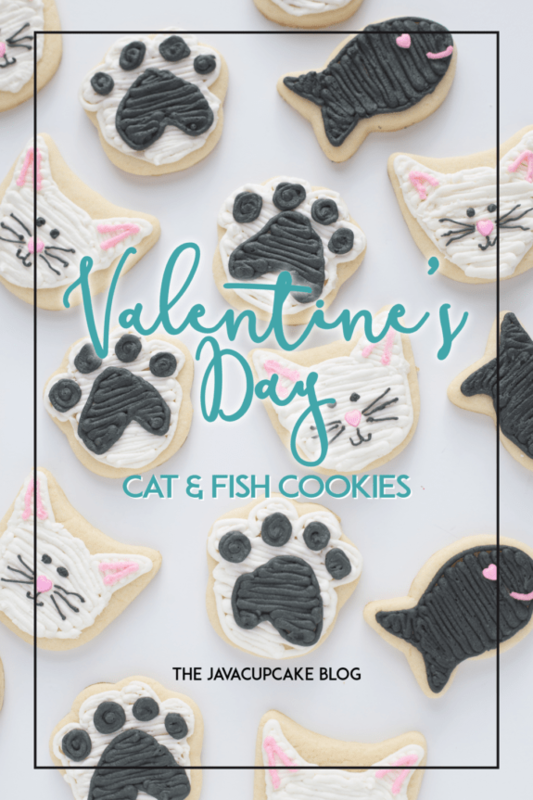 I’m not going to write the entire recipe for these cookies Valentine’s Day Cat & Fish Cookies out here because I’ve used this recipe so many times you can find what you need at the links below! 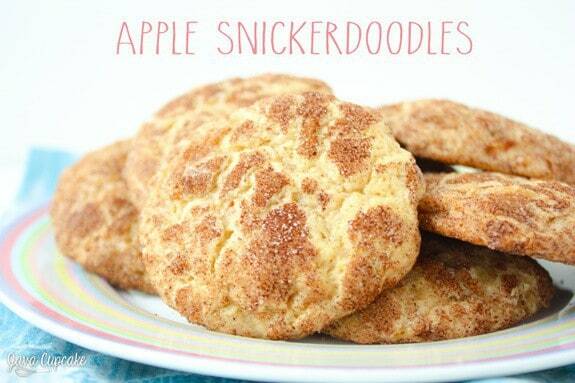 Use a full batch for a lot… double the recipe for a lot more! Fit a piping bag with a #4 tip and fill with white frosting. Fit a piping bag with a #4 tip and fill with pink frosting. 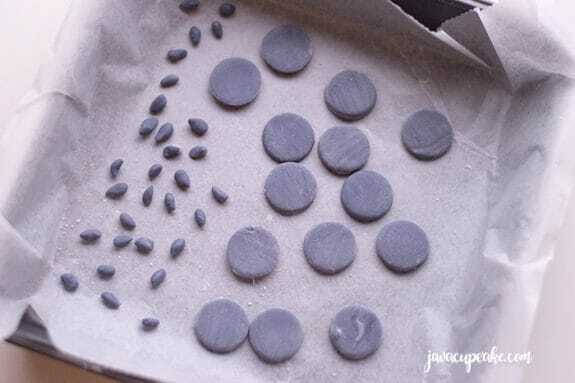 Fit a piping bag with a #1 tip and fill with black frosting. Outline the kitty head with white. Fill in the outline with a back and forth pattern. Using the pink buttercream, pipe two lines to a point for the years. 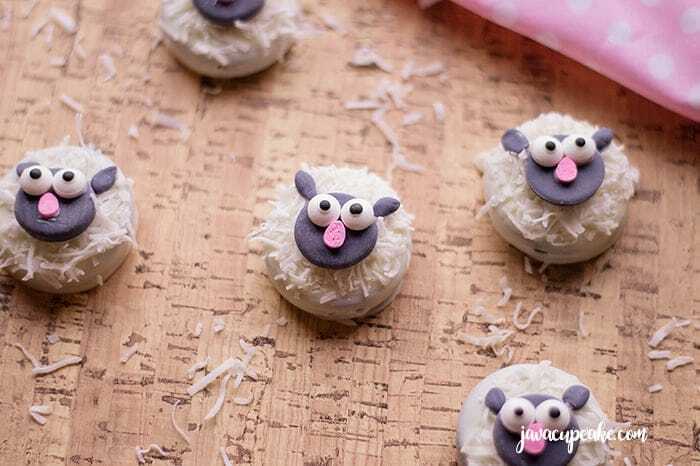 Using the black buttercream, pipe 2 eyes, whiskers and mouth. Add the pink heart for the nose. 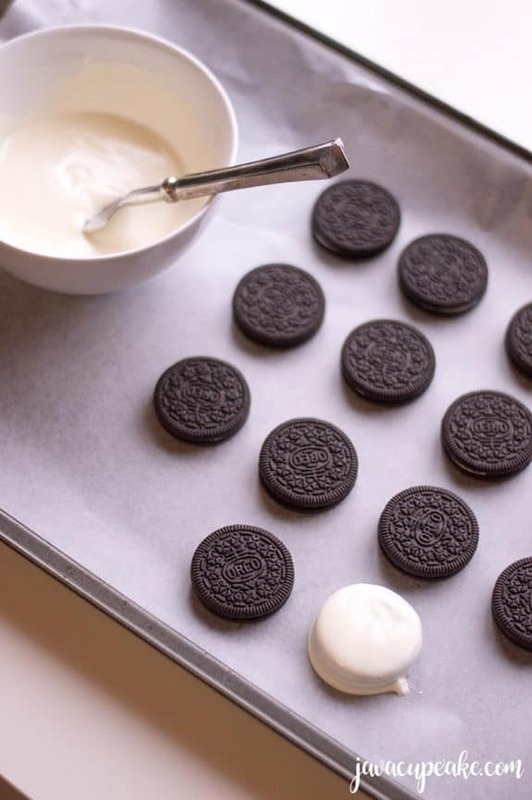 Allow the cookies to set out flat for a few hours so the frosting crusts over. Fit a piping bag with a #4 tip and fill with black frosting. Outline the paw with white. Fill in the outline with a back and forth pattern. 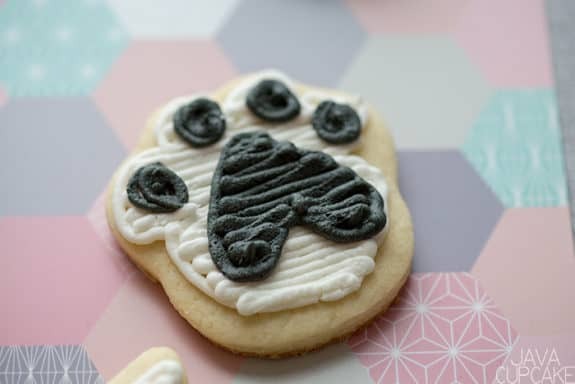 Using the black buttercream, pipe the four “toes” and the palm of the paw. 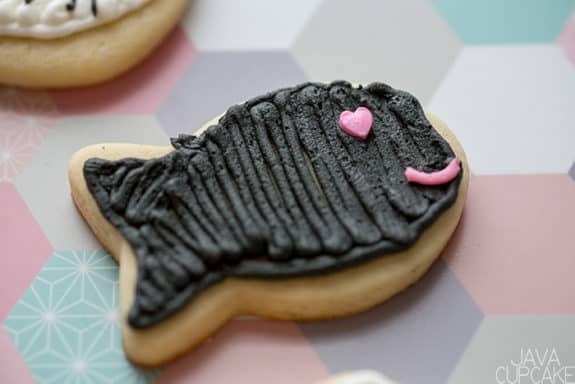 Outline the fish with black frosting. Fill in the outline with a back and forth pattern. Using the pink buttercream, pipe a little half smile/mouth. Add the pink heart for the eye.